Sometimes, life can get a little nuts. Taking a vacation is a great way to relax, recharge, and do yourself some good. What better place to vacation than the mountains of Western North Carolina? If you’re looking for the perfect vacation rental, we should talk about Writer’s Block. 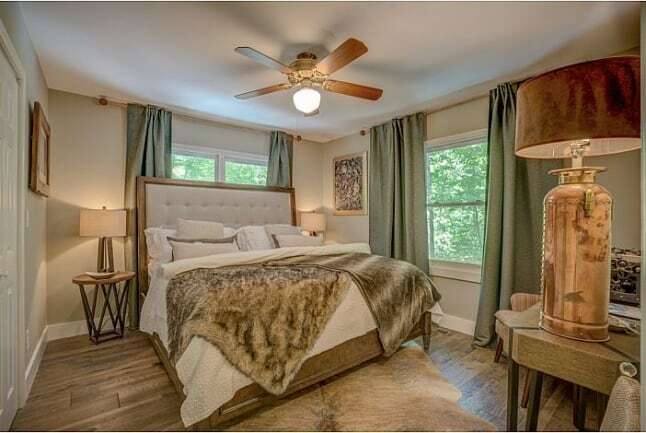 No, not the “Writer’s Block” phenomenon we all get from time to time, I mean this fabulous vacation rental in Saluda. It is the spot for a couples getaway in the mountains, a family vacation, or a solitary trip for some much-needed R&R. 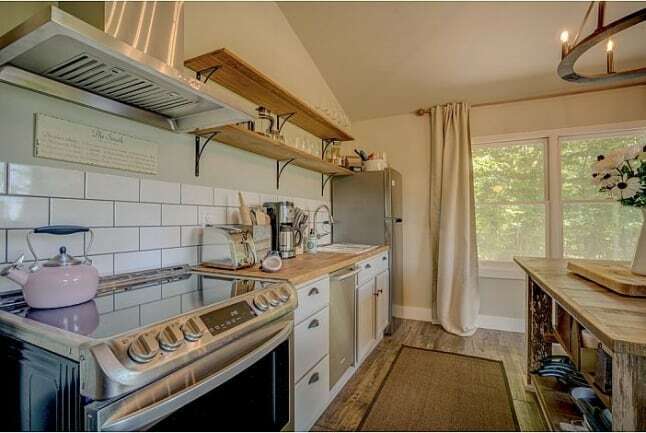 Prepare to fall in love with this adorable Saluda vacation home. 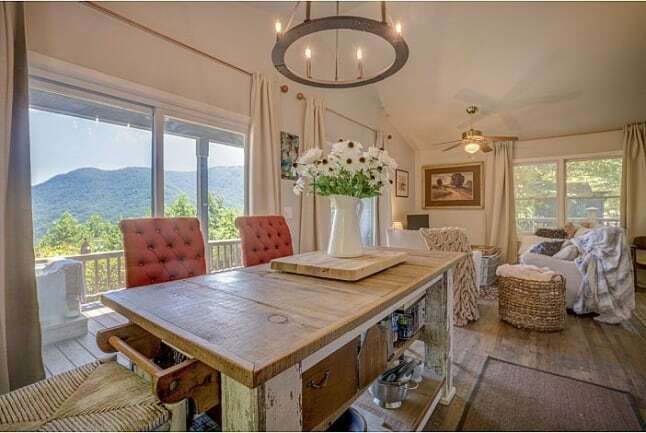 Make the absolute most of your mountain getaway in this cozy space. This living room is the perfect place to curl up with a good book, or a couple of good friends, to just relax and be at peace in a beautiful setting. Writer’s Block has two bedrooms and one bath, so it’s great for a weekend getaway with friends! While it may be cozy and charming, there’s also plenty of space to spread out. 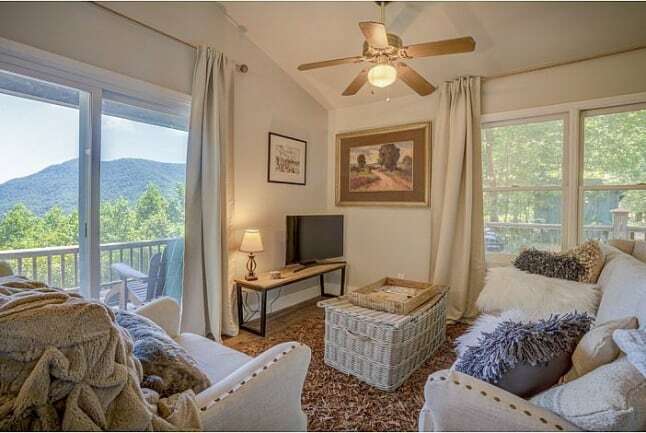 In addition to a gorgeous interior, the large back deck offers incredible views of the Saluda mountains. 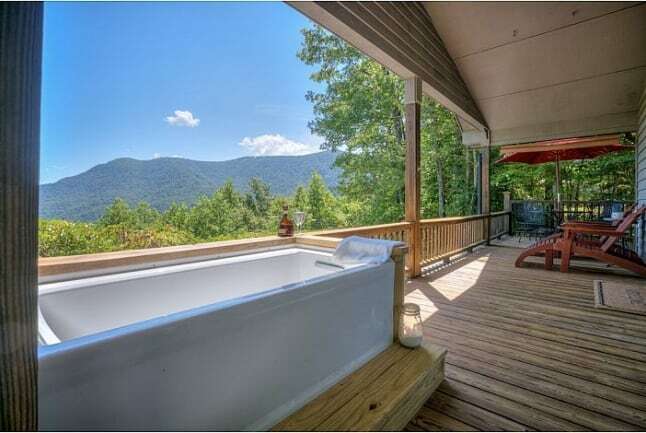 Step onto the back deck to take in the awe-inspiring views of Western North Carolina’s mountain range. This vacation rental has it all: a lovely interior, great outdoor entertaining space, plenty of amenities, and an amazing location! If outdoor adventure is your thing, you’re going to love Saluda! This vacation rental is just 13 minutes away from the Gorge Zipline Tours, 25 minutes from the Sky Top Orchard, and less than 30 minutes from the Tryon International Equestrian Center. After a day of adventuring, come home to this adorable home away from home. Imagine soaking in a hot bath tub, a glass of wine or mug of tea in hand, and enjoying this beautiful view of the mountains? Even if you don’t necessarily enjoy the adventure of the great outdoors, we can all appreciate this magnificent view. Saluda has little light pollution, which means you’ll have amazing views of the stars and the galaxy. What more are you looking for in a vacation rental? Ready to Fall in Love with Western, North Carolina? We’d love to introduce you. Give us a call today to learn more about vacation rentals in Western NC. Booking for places like Writer’s Block tend to fill up fast, so you better act quickly if you’re looking for the perfect mountain getaway!